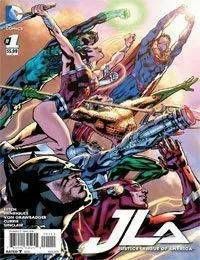 It's massive widescreen JUSTICE LEAGUE action and adventure from superstar writer/artist Bryan Hitch! In this extra-sized debut issue, the League comes up against an armada of aliens heading for Earth that claims to be a peaceful religious tribe. But something sinister is lurking in their ranks... something with ties to ancient Krypton!